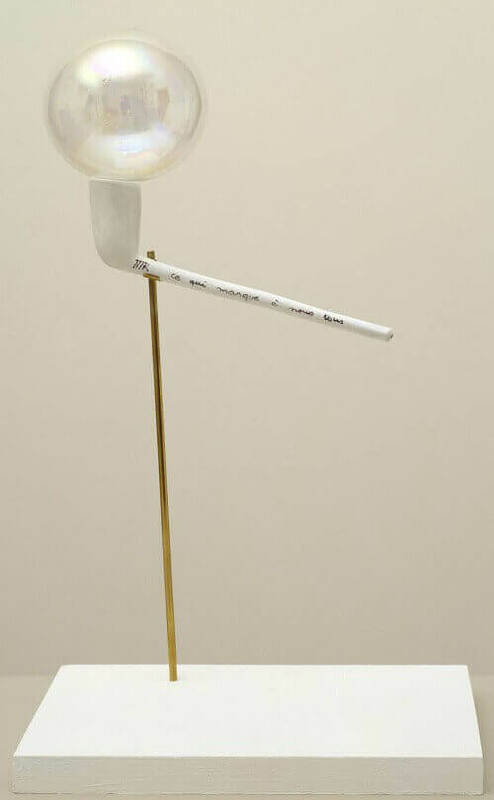 Ce qui manque à nous tous, 1927, editioned replica 1973, consists of an inscribed clay pipe and an iridescent glass bubble. Its title, which can be translated as 'What We All Lack', does not prescribe the solution to life's ills, but suggests at least that some part of the answer lies in the childhood pastime of blowing bubbles, in dreaming, and in the pleasure to be taken from evanescent beauty. According to Arturo Schwarz, Man Ray's dealer and author of a monograph on him, the title was derived from a quotation from Engels, one of the founding philosophers of communism, 'Ce qui manque à tous ces messieurs c'est la dialectique' ('What these gentlemen lack is dialectic'), reproduced in capitals on the cover of the surrealist group's magazine, La Révolution surréaliste (Paris, no.8, 1 December 1926). Man Ray told Schwarz, 'Actually, I had in mind "imagination", not dialectics, what we all lack is imagination'. The concept of the work dates back to 1927 when the Galerie surréaliste, Paris, announced the making of editions of this and other fantastical objects by several artists. It is questionable whether Man Ray made more than one of the advertised edition of twenty in this period, and it is believed the original prototype was quickly lost. In 1935 Man Ray made a replica that was included in the Exposition surréaliste d'objets held at the Galerie Charles Ratton, Paris, in 1936. According to the catalogue, the work was known as Ce qui nous manque à tous, a slightly different title but one which has the same meaning. The exhibition was accompanied by a theoretical text by the leader of the surrealist movement, André Breton (1896-1966), that described the many types of surrealist object and the ways they 'perturbed and distorted' conventional conceptions of reality. In the 1930s the surrealist object was conceived largely in terms of a psychologically charged notion of desire and in the light of the surrealists' poetical testing of the descriptive role of language. Man Ray's objects, however, typically expressed a lighter, more playful vision. This object was given life by nothing more substantial than air and the play of light on the iridescent glass surface that, like a photographic lens, can reflect an inverted image of surrounding reality. In contrast to Max Ernst, for example, Man Ray did not explore the psychoanalytic roots of personal obsessions and fantasies. His objects were not 'objects of desire' but rather, as he said, 'objects of affection'.